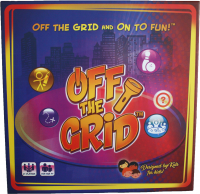 Off The Grid™ Board Game is a fun game that gets kids “off the grid” and lets kids play the way they know best—by being creative and interactive! Play with the lights out using flashlights, and select fun activities from a deck of 42 activity cards! Play 5 activities and declare the ultimate winner! Add a Review for "Off The Grid"